Mogadore, OH. Two years after introducing a two-bow lineup of high-quality entry level crossbows, Wicked Ridge Crossbows™ has decided to step up its game with its NEW high-performance Raider CLS™. 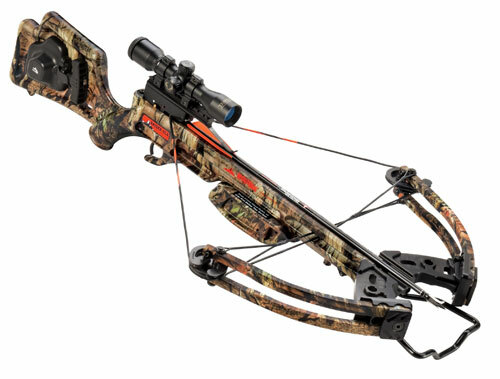 The Raider features an economically executed variation of TenPoint's powerful Compact Limb System™ (CLS) bow assembly. Unlike TenPoint's one-piece CLS riser and foot stirrup, the Raider comes with a detachable, lightweight, coated aluminum foot stirrup. Its 12-inch IsoTaper Limbs™ are fitted with MR™ Cams and D-75 string and cables. Together, these features create a smooth-handling, high-performance crossbow that shoots 330 fps with 101.5 foot-pounds of kinetic energy. "We were blown away during the test phase of producing this bow," said TenPoint and Wicked Ridge CEO, Rick Bednar. "There just isn't another crossbow on the market at this price point that shoots as quietly and smoothly with this kind of speed, power, and accuracy." With its NEW CLS bow assembly and an injection-molded composite semi-skeletal Verton® stock and ACRA-ANGLE™ barrel assembly, the Raider weighs in at 7 pounds. In addition, the stock is fitted with a safety-engineered winged fore-grip designed to help prevent finger and thumb injuries. The Raider CLS comes equipped with a TenPoint™ 3x Multi-Line™ Scope and, like all Wicked Ridge models, it features TenPoint's patented DFI™ (dry-fire inhibitor) and patented 3-1/2 pound Power Touch™ trigger. Equipped with the patented ACU-52™, the Raider CLS is double-dip fluid imaged in Mossy Oak's® popular Break-Up Infinity® camo pattern. Like all TenPoint crossbows, all Wicked Ridge crossbows are manufactured in the U.S.A.